Gps Reviews - Garmin GPS Reviews, Magellan GPS Reviews, TomTom GPS Reviews. A few years ago, when personal GPSs first became available, every geek from here to Poughkeepsie was enthralled about the possibility of always knowing exactly where on the planet he or she was. While the Garmin eTrex isn't the most feature-rich GPS out there, it will definitely come in handy if you don't want your next camping trip to end up like a scene from The Blair Witch Project. The eTrex is sort of a dumbed-down, rugged version of the company's more advanced eMap. 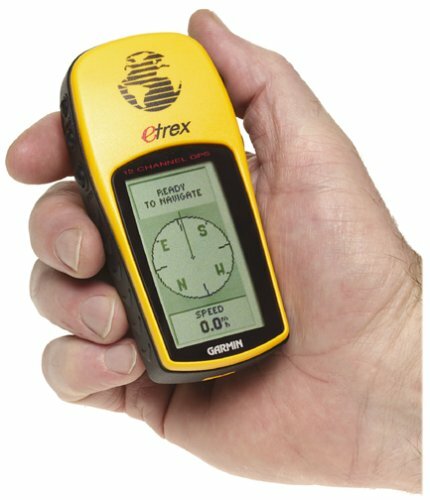 Designed specifically for hiking, biking, and camping, the eTrex is one of the easiest-to-use GPS units available. It offers the ability to track up to 12 satellites so you never lose contact with one. The eTrex won't work inside--however, we don't anticipate that you'll get lost inside a building very often. Among the eTrex's notable features is its ability to calculate your current and average speed. We used the eTrex to determine the distance from work to home, and to calculate how fast we were walking. This helped us gauge the average time it should take to get to work. This feature should really come in handy on extended hiking, camping, or cycling trips where planning your average speed and tracking the distance traveled is critical. Sticking with its theme of simplicity, the eTrex has only five buttons, making it easy to use with just one hand (It's specifically designed for the left hand.) Weighing only 5.3 ounces with the batteries installed, the eTrex is also ultralight, making it an easy addition to a daypack. The eTrex is also waterproof, so a little water shouldn't damage the unit. I recently bought an E-Trex primarily because of the low cost of the unit. I am very satisfied with my purchase. I am surprised how rugged it feels and it appears to have a little more knock-ability than some other handheld GPS units I have used. I would have preferred a GPS with cross track error capability because I am also a recreational pilot, however the latest software revision (1.07) does show your position relative to the track line between two current waypoints on the map screen and this can be used to correct cross track error. I imagined the lack of buttons would have proved to be frustrating however this is not the case as the menus are logical and concise. Alphanumeric entry is via drop down menus, which let you quickly select numbers and letters for waypoint entry. Up to 500 waypoint entries are available and names are limited to combinations of up to six letters/numbers and there are many icons to choose from. You can quickly mark your present position as a waypoint by holding down one of the buttons for a second. It has all the usual nav formats and measurements can be displayed in Nautical (knots included), Statute (yards not included) and Metric. I have used it bushwalking through fairly dense scrub and tree canopy and it did tend to track satellites well. There were a few short occasions where it lost signal in particularly dense cover (to be expected with a relatively small internal antenna) however it recovered within about ten seconds in lighter cover. I would not recommend relying on the GPS compass feature in dense cover because it did have trouble maintaining heading information updates in low satellite coverage areas. I am not disappointed with its performance in dense bush, and as anyone familiar with units with small antennas will know, it is just something you live with. I was using a magnetic compass in particularly dense areas where I experienced poor coverage and it is good navigation practice to use a magnetic compass and map in conjunction with your GPS anyway. In light and open cover I routinely get 8 metre accuracy and sometimes as good as 5 metre accuracy. If I turn it on outside near my last fix it usually gets a lock in about 10 seconds. It maintains accuracy on the passenger seat of the car and is even better up on the dash. It gives a good presentation of speed, heading, time and distance to go on one big clear screen and the backlighting is very good. It has a nice rubbery casing and this makes it ideal to wedge it in an upright position between the dash mat and the windscreen while I am driving along. I decided the genuine Garmin data upload cable was too expensive and made my own lead from a cannibalised mobile phone charger. Uploading the latest free Garmin software revision (mine was shipped with v1.05) was a snap and I was very impressed with how easy it was to update. The new software has some nifty features worth getting. I have used some shareware utilities such as "GARtrip" and "GPSutility" to upload waypoints from scanned paper maps and street directories, and you can edit, upload and download waypoint info and track info. It is obviously faster to modify waypoint info from your computer keyboard and then upload the new waypoints in seconds. It has a non-volatile memory so flat batteries don't present any risk of losing your stored data. Any disappointments? Only a couple of minor ones. It is very hard to tell if the backlight is on in sunlight, and because it toggles on and off by momentarily pressing the power button, you can accidentally bump it on and be wasting batteries. You can't scroll the map around; you can only zoom in and out. This makes it difficult to review your recorded trail in any detail, and you need to zoom out and lose definition to see much of your trail. It gets cluttered with waypoint info when you zoom out trying to see your whole trail although you can turn the waypoint display off. In summary, it is a compact gem of a GPS with a big screen and for the price I believe it represents excellent value. Make yourself a data lead or buy one from Garmin because the shareware computer-based utilities are cool. Two thumbs up. Imagine yourself getting out on the lake, the river or even onto the saltwater and taking along your Humminbird Matrix 20. You will easily find out where you are when you plug into the GPS guide. It will help you find your favorite hotspot. Then, you can use the sonar to give you a great picture of what’s down below the surface. You see your fish. You know where it is and where it is heading. You can land your line right where it is and within minutes be reeling him in. If you didn’t have the Matrix 20, you would still be trying to find that hotspot! The Matrix 20 is a great fishfinder because it is portable. It is easily moved from one location to the next making it easy for you to fish no matter where you are. Besides this feature, the Humminbird Matrix 20 offers several other features. Let’s take a closer look at how and why this fish finder will help you see clearly where your fish are hiding. First off, the Matrix 20 uses a single beam, 24 inch sonar. It is capable of going down 800 feet. That’s 800 feet of clear viewing for you. You’ll know what’s floating down there, where it is, and then you’ll be able to plan your course of action. You will also find that the Matrix 20 is GPS ready. You can connect your hand held GPS to it and benefit from the easy reading ability that the Matrix 20 offers. It also features a water temperature gauge. This is helpful if you know your fish. Some fish prefer certain temps to swim in. If you are not in warm or cold enough water, they are likely not to be either. You don’t need to worry about the Matrix 20 getting wet out there because it is waterproof and you’ll not need to worry about it falling. It is impact resistant. This is great especially when the boat gets a little too rocky! Fill your cooler with fish when using the Matrix 20! The Eagle Sea Champ 1000C is a great tool. Yes, we can not say it any simpler! It offers you some of the best features in fish finding gear. You will be impressed with its precision and its high quality as well. Here, let’s take a look at some of the features that makes this fishfinder something similar to the perfect tool. Here are some of the Sea Champ's features. You can start by checking out the Eagle Sea Champ's awesome display. It is six inches big, just about the right size for easy viewing as you relax on your boat. It also has other features on the display that make it a good one including ultra bright for easy viewing in almost any type of light, 256 colors active matrix TFT LCD, high definition resolution and fluorescent cold cathode backlit screen and keypad. So, what does all of that give you? It delivers a clear picture that is easy to read. It gives you a picture that you can react to, meaning that you can see what type of fish are down there, the type of structure and even the size of the fish so that you can react and do what you need to, to get the big catch on board! It can be used in just about any light including at night! Still, there is more. The Eagle Sea Champ also features some of the best in sonar. It has the capability of going 1500 feet down making it a great distance fishfinding unit. It's technology separates fish from nearby structures or the bottom which will help you determine not just that something is there but what is there. This helps you decide if it’s something you should go after or not. Still, there is much more. The GPS + WASS reception uses satellite technology to pinpoint your location to a few yards. This will help you to know where you are and where you need to go. You won’t get lost if you turn around too many times. All in all, this Sea Champ will deliver for you all of the features that you need to capture the fish that you need and want! Go home with a full cooler thanks to this awesome tool! Looking for a reliable fishfinder? Then check out the features that you get in the FishMark 320. This great quality finder will bring in the fish you are searching for and deliver a foolproof method for catching them every time. The sonar on board is perfect and is one that you will be impressed with. Just imagine sitting on deck on a beautiful sunny day, not having to guess where the fish are - your FishMark 320 will pinpoint where they are, and when to cast. The FishMark 320 has many features to mention here. The 320 has a five inch diagonal screen with high definition 320x320 LCD resolution. It has 16 level grayscale and a backlit screen and keypad. So, what does all of that do? It gives you a great sized screen (perfect for viewing) that is clear and crisp in the images that it displays. You can see the details and therefore know what you have to deal with. But, what shows up on that screen is what really matters. And, the FishMark 320 has what you need it to. It has depth capability of 800 feet which is perfect for the average lake. It has a 60 degree angle of detection so that means you’ll get what is below your boat and what is next to it. You also get other features that you will love including the FishReveal technology which shows your target even if it is hiding under clutter which we all know is down there. It features HyperScroll so that you can get a reliable reading even when your boat is hitting high speeds, great for finding schools of fish when you are in a hurry. You also get GRAYLINE which will help to differentiate between the fish and the bottom or structures. Fish ID and Fish Track help you to locate and track the fish that you want to catch. Don’t worry about not finding the right one or losing it if you turn your head. Ever have a fish hide on you? It won’t be easily to hide with this technology! All in all, the Eagle FishMark 320 is the perfect companion on board your boat this fishing season! The fully loaded Lowrance iWay 500C Automotive GPS+WASS Receiver with MP3 Player not only gets you where you need to go, but it also lets you relax along the way with your favorite digital music files. Simply pick a destination via the easy-to-use touchscreen display, choose your favorite tune, and you're on you way. The iWay 500C will automatically display the best route and give you turn-by-turn directions with voice and visual guidance while you listen to your music. And being WAAS-enabled means that the iWay 500C is accurate within three meters, making it a great fit for scavenger hunts as well as road trips. When it comes to navigation, the iWay 500C features both street address searching and best auto-routing choices that help you to choose the most efficient route. With these options, you can choose which toll road or interstates to choose or avoid, and you can find a route that avoids left-hand turns. The unit's mega-memory storage gives you access to up to 1,000 waypoints. The hard drive also holds a ton of other information as well, including a preloaded Navteq turn-by-turn database with maps of the entire continental U.S. and Canada. With the internal USB port, you can update the maps with your PC, ensuring that you have the most up-to-date information available. It does everything it says and the mp3 player works well, though it would be nice to have the playlist in a list rather than folders(I haven't read the entire manual yet, so that may be an option). Every address I have searched, it has taken me to without fault. It's off by a few feet(10-50 depending), but it gets you close enough so that you can see your destination visually. I would rather have this than a built in system that most cars offer since I can transfer this very easily between my three cars. There is no setup required, I plugged it in, turned it on and immediately began navigating. I also enjoy the trip meter that tells you fastest speed achieved, average speed and mileage travelled as well as the time elapsed. All my friends who have the built ins say mine is much better than theirs and for 1/3 the price.